For good or for worse, going through a major change is very difficult for most people. A smile makeover is no exception. One of the questions we are often asked is how will my temporary crowns or veneers look like. This question is usually asked either because of past experience or may have heard from friends that they are horrible and have to hide from the public. Unfortunately the perception is already set that they are in for a rough couple of weeks until they get the actual veneers or crowns. This definitely should not be the case. There are a couple of reasons why we place temporaries. One is for protection of the tooth. Second it allows for a preview of the final restorations. At NYC Smile Design we fabricate them as close as possible to the final restorations. For the next few days we follow up on these temporaries and make assessments about the shape and color. 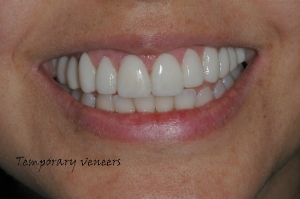 This allows us to refine the temporaries and determine how we want the actual veneers and crown to look like. That being said there are a couple of shortcomings with temporary veneers that we need to be aware of. 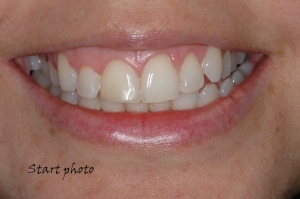 Here are two images of a smile one is the start photo and the second is an image of temporary veneers. Now you can judge for yourself.